NEW YORK, December 4, 2018 — CoverWallet, the leading insurtech company that makes it easy for small businesses to understand, buy, and manage insurance online, today announced CoverWallet for Agents, a dedicated platform for insurance agents. Through the technology platform, agents benefit from a fast, simple, and efficient way to provide commercial insurance to businesses, with a single point of entry to access top carriers for multiple types of policies. 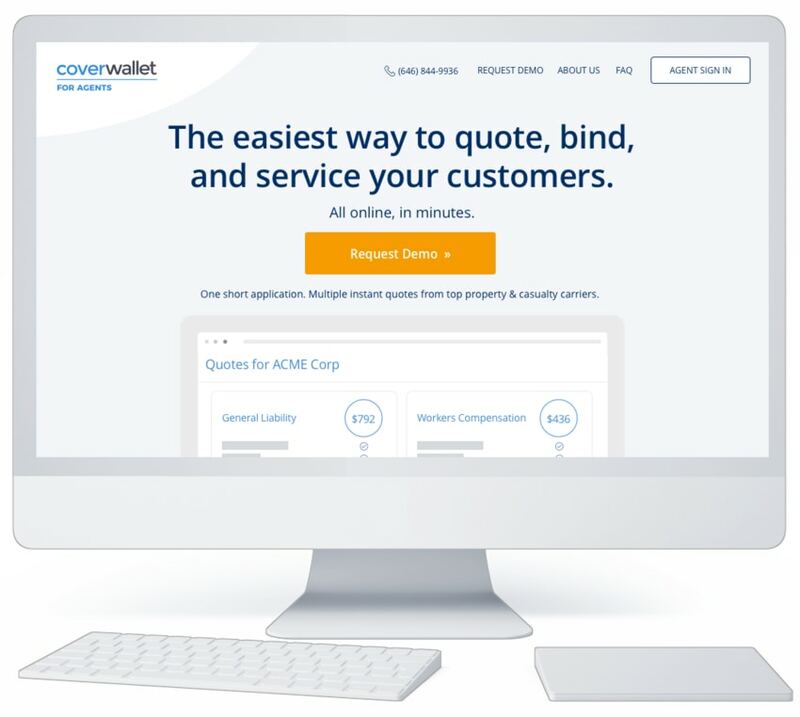 CoverWallet for Agents leverages the award-winning CoverWallet platform and provides agents with instant quotes, online bindable policies, and real-time proof of coverage. Through a dynamic online application that uses data and analytics, agents instantly receive quotes from top carriers for lines of business including General Liability, Business Owners Policy, Workers Compensation, and Professional Liability. The platform is currently integrated with top national carriers including Chubb, Starr, CNA, and AmTrust. CoverWallet has more than quadrupled its business in the past year and has tens of thousands of customers. According to CB Insights, the small business insurance market is valued at $100 billion. With the launch of CoverWallet for Agents, the company increases its distribution to the millions of businesses that buy insurance through insurance agents. Prior to publicly launching the platform, CoverWallet conducted a pilot program. With the launch of the new platform, Michael Konialian has been promoted to Vice President and General Manager of CoverWallet for Agents. For more information on CoverWallet for Agents and to start using the platform, please visit agents.coverwallet.com. CoverWallet is the leading tech company reinventing the $100 billion U.S. commercial insurance market for small businesses. Based in New York and launched in 2016, it has received more than $30 million in funding from renowned investors including Union Square Ventures, Index Ventures, Two Sigma, and Foundation Capital, as well as Zurich Insurance Group and Starr Companies. Powered by deep analytics, thoughtful design, and state-of-the-art technology, the company is the easiest way for small businesses to understand, buy, and manage insurance online.